Surround yourself with Iceland’s remote wilderness and untouched scenery. A truly unique experience in amazing landscape. Hiking through the magnificent landscapes of mountains and small bays of the East is an unforgettable experience. The unique Eastern mountains come in all shapes and sizes and they come in a variety of impressionistic colors; everything from the black sands of the beaches to the pinkish orange hues of the mountain ridges. The closeness to the ocean sets its mark on this tour. Each day we follow old trails between isolated coves and fjords over colorful hills and down green valleys to the sea and the soothing waves of the North Atlantic Ocean. This combination of mountains and ocean is what makes this trek a unique experience. Another advantage is the milder climate that can be expected at this low altitude. The area remained populated until the early seventies and abandoned farms and ancient farmsteads set their mark on the surroundings, however, sheep may be the only living thing connecting us to those former times. Accommodation in well equipped and comfortable huts. This tour can be combined with the tour Lónsöræfi Trail. 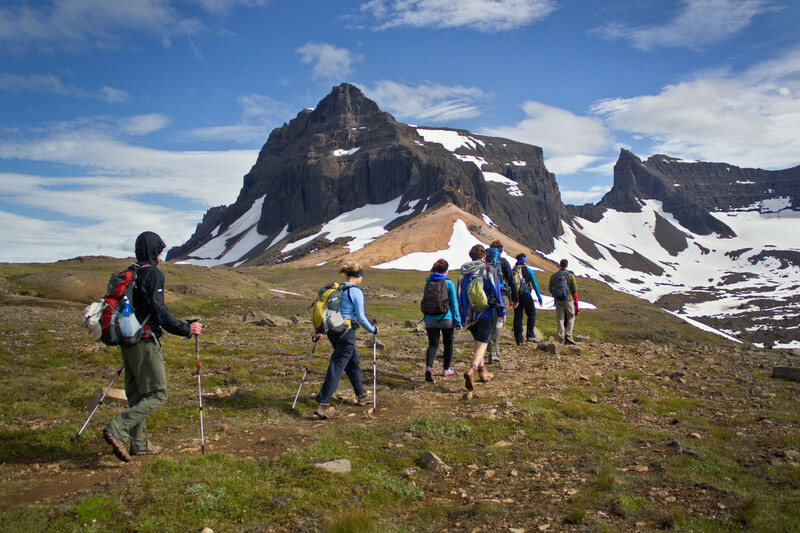 Read more about all your East Iceland Trekking options.